It is thought that Language have originated when early humans started gradually changing their primate communication systems to structured languages. Langugae is simply a system of communication which consists of a set of sounds and written symbols which are used by the people of a particular country or region for talking or writing. Languages began thousands of years ago and determining the oldest language is highly debated throughout the world. 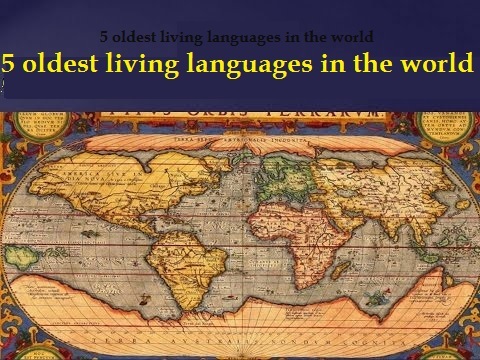 However, linguists revealed that the following 5 languages are among the oldest living languages around the world. Arabic is one of the oldest spoken language and it carries a great history and civilization behind. The earliest example of Arabic inscription dates back to 512 CE. At present, around 300 million people speak Arabic around the globe. Arabic belongs to the Semitic language family which includes Aramaic. It is the most common spoken Semitic language in fact. Arabic language can be divided into two versions Modern Arabic and Classical Arabic. Classical Arabic is the language of the Quran, which is the sacred book of Muslims. Arabic is the official language of Egypt, Saudi Arabia, the UAE, Qatar, Syria, Lebanon, Kuwait, Oman, and many other countries. There are many different dialects and branches of Arabic. Greek language dates back to around 1500 BC. Though it has evolved considerably from its ancient version it is still spoken by nearly 13 million people. The modern form of Greek is the official language in Cyprus and Greece. It is also an official language on the EU and spoken in Greek communities around the world and in Turkey, Albania and Italy. Over a thousand years ago, some of the world’s most respected scholars and philosophers used to communicate in Greek. Many of the foundational documents in Western philosophy, like the works of Aristotle and Plato, logic and mathematics, astronomy and other branches of science were originally written in the language. The Greek alphabet originated from the script used by the Phoenicians. Later, it became the source of the Gothic, Coptic, Armenian, Cyrillic and Latin systems of writing. Tamil language is a member of the Dravidian language family and was spoken primarily in India. Tamil made its first appearance in 300 BC. The literature collection in Tamil, which is a classical language, is very vast. It is also varied. Tamil is spoken by nearly 80 million people in southern India, Sri Lanka, and Singapore. It can be classified into Modern Tamil, Classical Tamil, and Colloquial Tamil – all three of which are popularly used today. The earliest appearance of this language can be traced back to the days of the Roman Empire, which was formed around 75 BC. The Roman Empire elected to make Latin its formal language, making it an important language at that time. Latin was the origin of all the Romance languages – Spanish, French, Italian, Portuguese, Catalan and Romanian and many words today, including a number of words in modern-day English. Latin is still the official language of Poland and the Vatican City. Latin is taught at several higher education institutions around the world. Farsi is the direct descendant of Old Persian language, which was the official language of the Persian Empire. Persian emerged sometime around 500 BC. Modern Persian emerged around 800 CE, and it has changed sparsely since then. Farsi is the common language spoken in modern day Iran, Afghanistan and Tajikistan. The language is spoken by more than 110 million people. Though it is almost the same with little variation, it is called Dari in Afghanistan and Tajiki in Tajikistan due to political reasons. Several more languages could still make it to this list. Such as, Sanskrit which dates back to is from 200 BC and has influenced many modern European languages and Chinese that is more than 3,000 years old and now is the language with the most number of first language speakers. Share with us an old language that have survived and still in use up to date.